This is par for course in the immensely plot hole-riddled Skripal case, which since the story broke has been an endless barrage of ever-changing contradictory narratives the details of which nobody is certain of to any degree at all… except that Russia definitely did it. We’ve been told that the Novichok was planted in Yulia Skripal’s suitcase. We were told that it was administered via the air vents in their car. We were told that it was delivered by a weaponized miniature drone. We were told that the Novichok was smeared on the family’s car door handle. Now it’s either the house door or Russian buckwheat cereal, depending on who you’re reading. Nothing about the reports on this case are consistent except the adamant insistence in each and every one that it could only have been inflicted by the Kremlin. Of this the officials of Great Britain are so certain that a worldwide expulsion of Russian diplomats from allies of the United Kingdom was unquestionably the right move to make in a steadily escalating cold war environment. 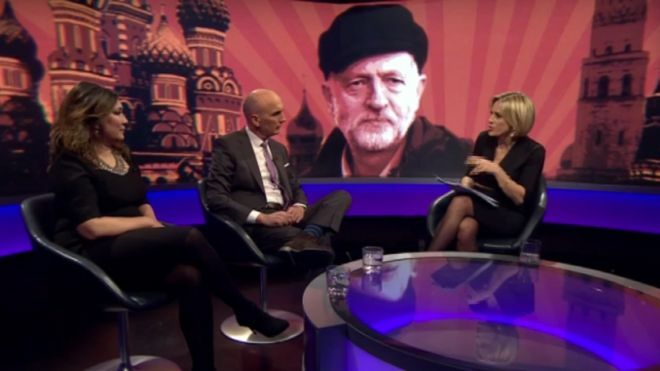 If you disagree and think a little more investigation is in order, then you are clearly a Russian puppet and should be depicted in Soviet-looking garb over a red-colored Kremlin skyline, as was opposition leader Jeremy Corbyn by the BBC last month. Isn’t that interesting? Isn’t it so very, very interesting how the people investigating this attack still don’t know their asses from their elbows when it comes to any aspect of the case, but it is absolutely beyond question that the Russian government was definitely with 100 percent certainty responsible for the poisoning? Even with two completely contradictory stories like the latest ones we’re being offered, Russia is definitely, definitely responsible. One traces back to a suspicious Russian national, the other an operation “so risky and sensitive that it is unlikely to have been undertaken without approval from the Kremlin.” They can’t both be true; either the nerve agent was placed in the cereal or on the door. But in both cases we’re led to be glaring at Russia for its heinous attack. Very interesting indeed. Perhaps even more interesting is the fact that Skripal had been living unmolested in the UK for years, and yet now just as the US-centralized empire begins worrying about losing its dominant position on the world stage a long-irrelevant former double agent is attacked by a terrifying nerve agent with a Russian-sounding name that both fails to kill him and implicates the Russian government (and, as an added bonus, could have been made by anyone). Very interesting how UK officials are now working to unite Europe against Russia at just the time where that is a strategically essential thing for the western empire to be doing right now. I’ve said it before and I’ll say it again: truth is the first casualty of war, especially cold war. The US-centralized empire has an extensive history of using lies, propaganda and false flags to manufacture public support for its agendas, and all of those things are essential components in cold war. There’s no reason whatsoever to give these people the benefit of the doubt when things smell fishy.